While discussions of incendiary devices in pre-modern times usually begin and end with the Byzantines and Greek Fire, the use of fire dates to Biblical times. Bronze age armies of the middle east and eastern Mediterranean figured out how to take the pitch or oil from naturally occurring wells and turn it into a weapon capable of being thrown by hand or hurled by catapult. The Byzantines deserve credit for weaponizing available fuel sources into something more potent. In the mid-eighth century, the eastern Roman Empire looked as if it would soon go the way of the western half. It was beset on its frontiers, from the Arabs to the south and Bulgars to the north. Drawing on ancient Greek records and scientific tradition, Byzantine alchemists developed Greek Fire. Primarily a naval weapon, special fire ships were fitted with tanks of fuel and pumps that could spray Greek Fire at enemy ships. By all accounts, it was a fearsome device. Supposedly, it ignited on contact with water and could not be extinguished. In reality, some sort of primer or pilot light ignited the fuel, and it only appeared to ignite on contact with the sea, but it would certainly burn on water making it a devastating naval weapon. It could only be put out by smothering. Byzantine fire crews kept sand and vinegar on hand in case of accidental fire. Its exact composition was a state secret. The liquid mixture was produced by very few (a single family by one account) and the troops who used it knew nothing of its preparation. A similar level of secrecy also applied to the working of the projection device. An infantry version of the pump/flame thrower device was also used with mixed results. It could be clumsy and slow. Once, the Bulgars managed to capture some of the Greek fire, but were unable to operate the equipment. 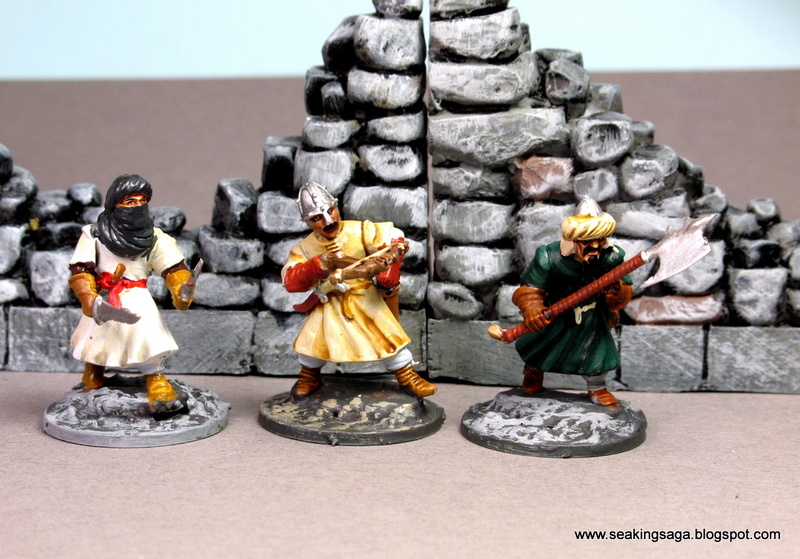 Sometime in the mid-tenth century, the armies of the Caliphate also began using a similar pump/siphon device that was handheld, in the fashion of the Byzantine device. Whether this was a result of reverse engineering of the Byzantine invention or the outright acquisition is not known. Incendiaries were devastatingly effective against Crusader siege engines. Saladin's use of naffata troops is well documented. Saladin sent troops armed with Naphta grenades against houses and civilians during an uprising in Egypt led by African troops. The Christian defenders of Jerusalem noted his use of incendiaries in catapults used to attack the city walls. During the Third Crusade, Swimmers smuggled containers of the fuel into Acre during the Crusader's siege of that city. While the Greek Fire of the Byzantines was a closely guarded secrets, Arab alchemists were more ready to commit their recipe to paper. 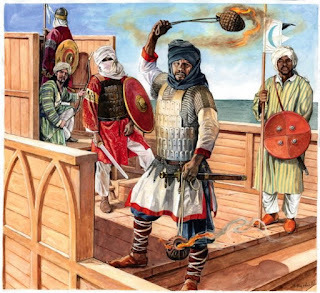 One of Saladin's chroniclers describers the burning substance as a mixture of tar, resin, sulphur, dolphin fat and goat fat. I suspect, the cost, availability and unreliable nature made widespread usage of naffata troops less than common. 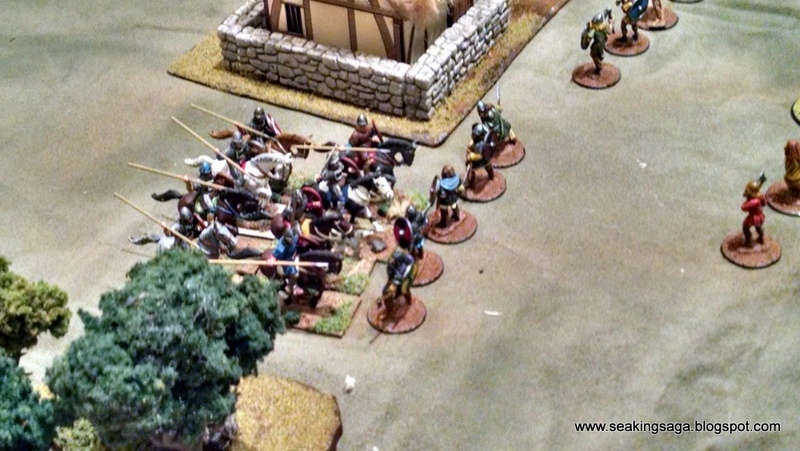 Overall, it is safe to say that outside of the navy, fire troops were not common, and very rare in the kind of fast moving skirmish combat that SAGA depicts. Because of its limited range and unpredictability, it was most often used against soft targets (civilians and civilian structures and in sieges). In SAGA, a unit of four Naffatun troops can be purchased for a single point. 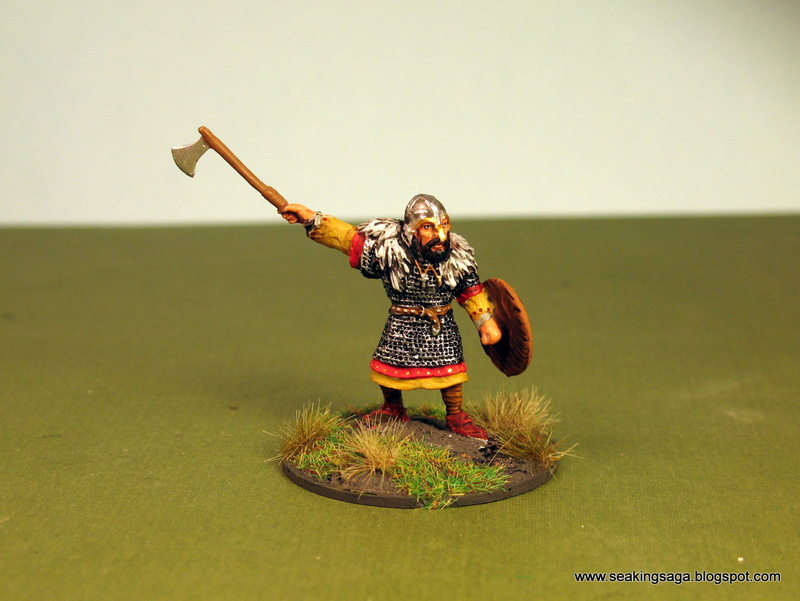 Up to two models can then be assigned to a unit of warriors, but not levies or hearthguard. Naffata shoot with a movement activation, similar to javelin throwers but only at short range. Since their weapons are an area effect attack, they have +2 to hit on attack rolls. They can generate between one and three hit dice each, up to the controlling player. Why not choose all three? That brings us to the Naffata's disadvantages. 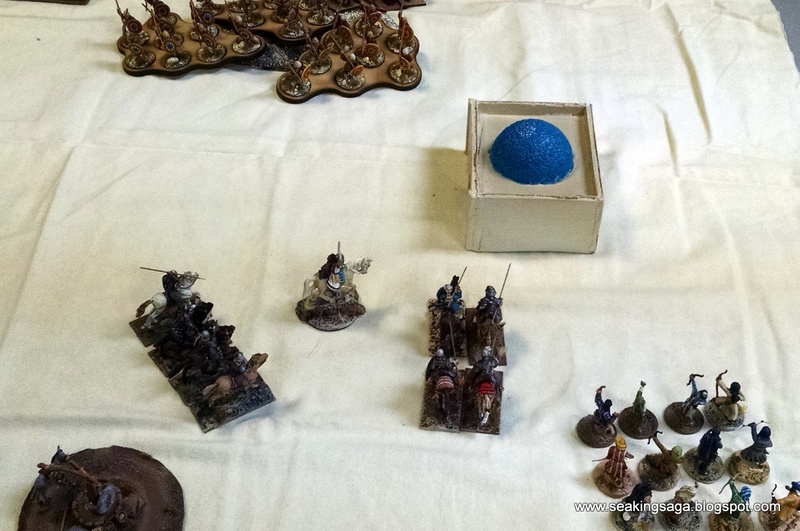 If a Naffatun rolls a "1" an accident has occurred and a friendly model must be removed from the unit, controlling player's choice. Another disadvantage, a considerable one in my opinion, is that unlike other shooting attacks, a naffata attack puts a fatigue token on its own unit. 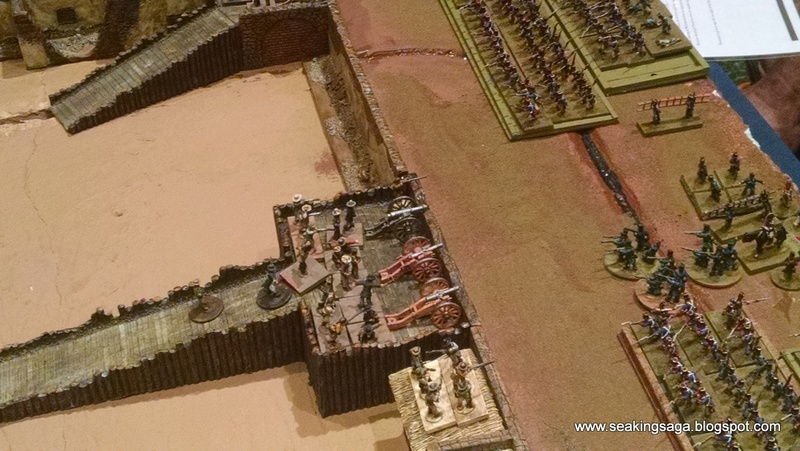 However, the defending unit takes at least two fatigues if it suffered any casualties. I would like to play these in my next match, mostly as a test of their balance in the game. AS SAGA as advanced, some of the new units have moved to the extremes in terms of bonuses and drawbacks. Correctly deploying them is more tricky than the shield wall and charge combat of early SAGA. I probably will put them into as large a unit as possible, not a 6 person squad shown above, given their propensity for friendly casualties. 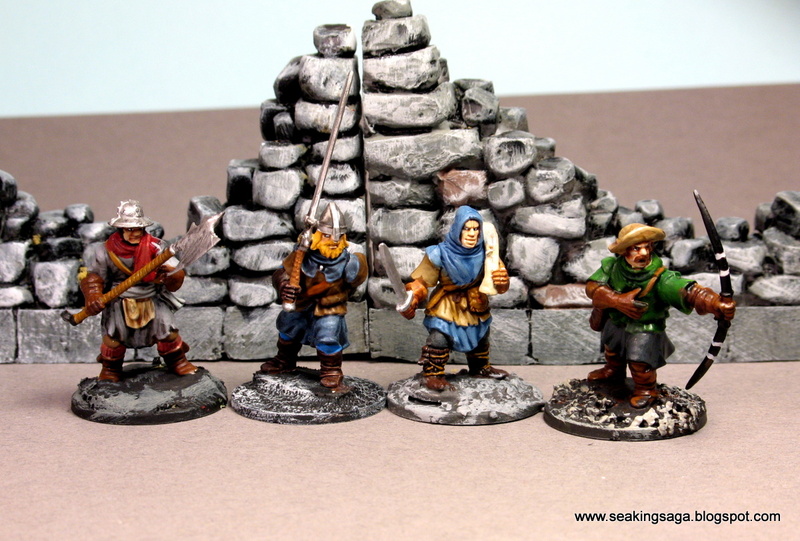 This week's painting work was mostly Frostgrave, but a slight conversion bears its posting here. First, two more sprues of Frostgrave plastics painted. 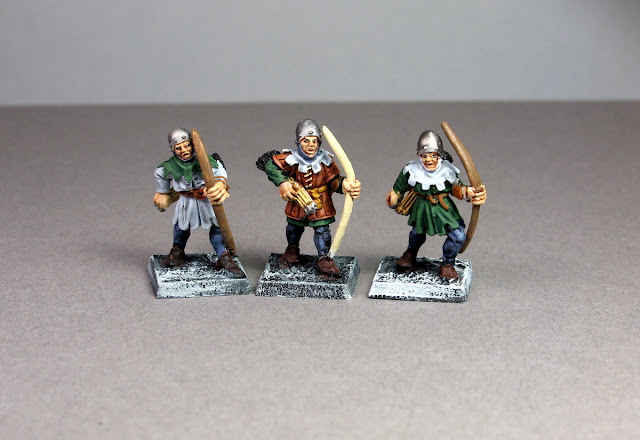 These are some really nice plastics, great for hirelings in your RPG game or as "rabble" in your late twelfth/thirteenth century wargame. Of course, some weapons will need to be toned down a bit - that two handed sword is a little over the top. The Frostgrave soldier's come with loads of extra bits. 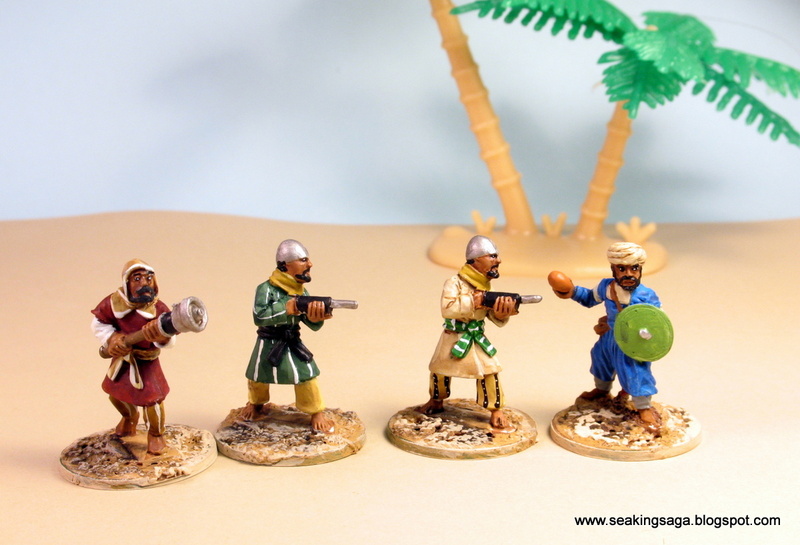 Work well with Gripping Beast's plastics, especially these Arab figures. 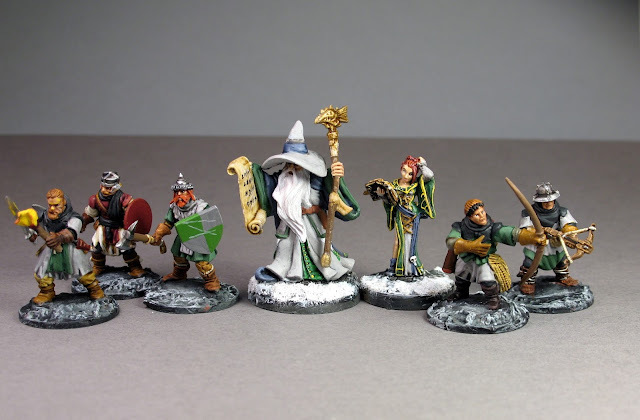 If you need an eastern themed Frostgrave army, or just want to spruce up your moors with axes and crossbows, the Frostgrave kit is not a bad place to pull from. I am always on the lookout for historical/historical fantasy comics set in the Viking Age, and this is an excellent find. Toil and Trouble retells the MacBeth story with a greater focus on the witches, specifically one of the three here named Smertae. The writer, Mairgrhead Scott, tells a familiar story with some key differences between this and other versions. Instead of observers of fate, the witches are active shepherds of fate, choosing who lives and dies by their power. 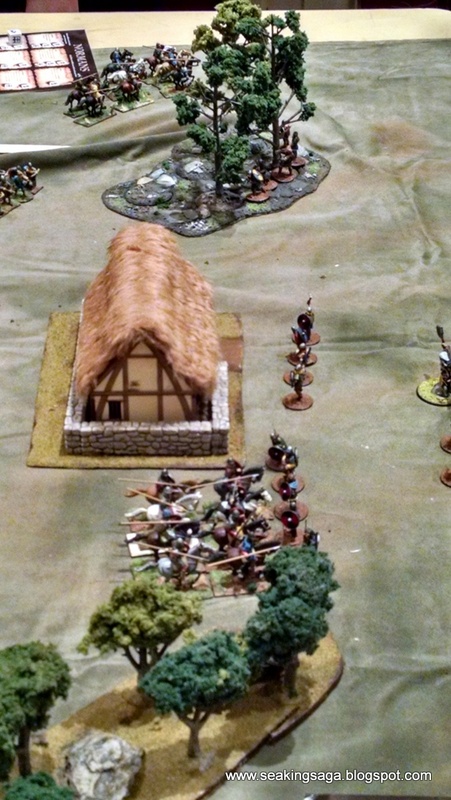 Book one ends where Shakespeare begins, with the battle against the Viking invaders. The real joy is this book is the art. Kelly and Nichole Matthews handle both expressive faces and epic landscapes with equal skill. Their style is built on clean lines and bright colors, and contains influences of Disney's Sleeping Beauty. Three issues are already out, buy them or wait for the collection. After the first two episodes, my tv viewing time became very limited, and this show dropped off my agenda. Thankfully, I was able to binge watch more of the episodes through my cable provider on-demand service. Though I am two shows away from the end, I am quite impressed. While I still think the producers should have given us an entire episode with Uhtred as a boy before advancing to his early manhood, the rest of the series is very well done, much better than History's The Vikings, which it begs comparison to. Bernard Cornwell's Saxon series features a Saxon born, Viking raised hero named Uhtred at the time of King Alfred. 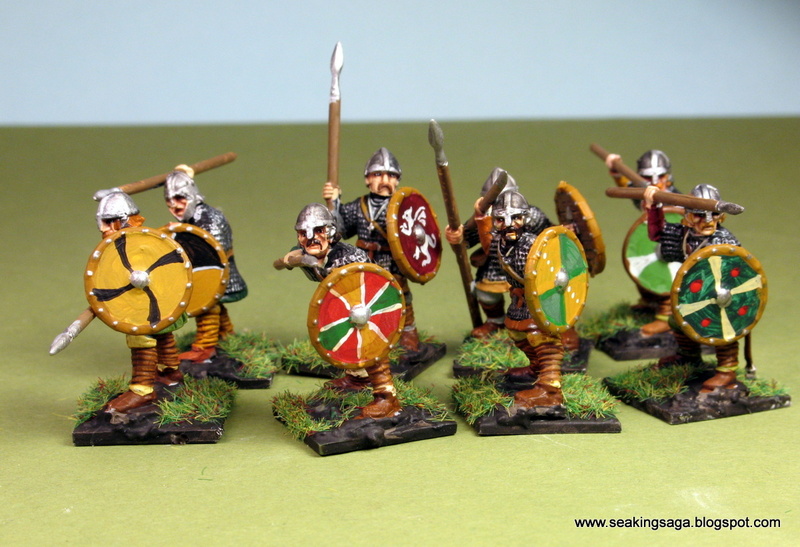 It has been a great series to read, and one that probably inspired me to collect Viking and Saxon miniatures. The first two episodes do have a lot to recommend, primarily the acting. Matthew MacFayden as the main character's father is spot on with the book, as is Ian Hart as Beocca, the kindly priest. 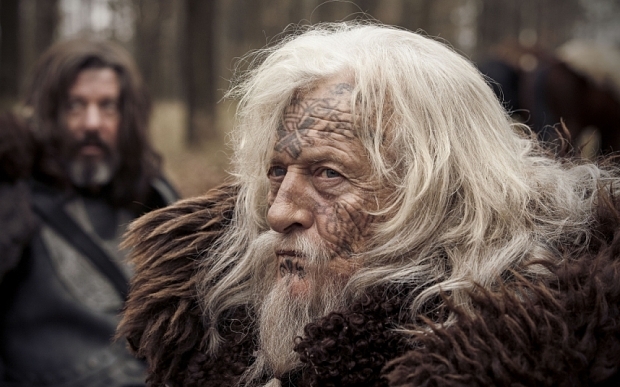 The actor playing Uhtred, Alexander Draymon, is fine for the young version of the character. If he can mature into the steely and brutal character from the novels remains to be seen. And any scene with Rutger Hauer is eminently watchable. My main critique with the first episode is with some of the pacing and story direction. If this is the first episode of an eight part miniseries, and this miniseries intends to only adapt the first book, The Last Kingdom, then this first episode has churned through quite a bit of the book. The heart of Uhtred's story is his internal conflict between his Saxon heritage and his assimilated Viking identity. A great deal of character development is lost when we advance so quicly from Uhtred's childhood abduction by Ragnar into his late teens. One key childhood event that sets up later conflict is shown, but very little of his embrace of the pagan religion. I understand that devoting two episodes out eight to a child may alienate action-seeking viewers, but I think it is essential for understanding Uhtred's torn loyalties between Saxon and Viking. 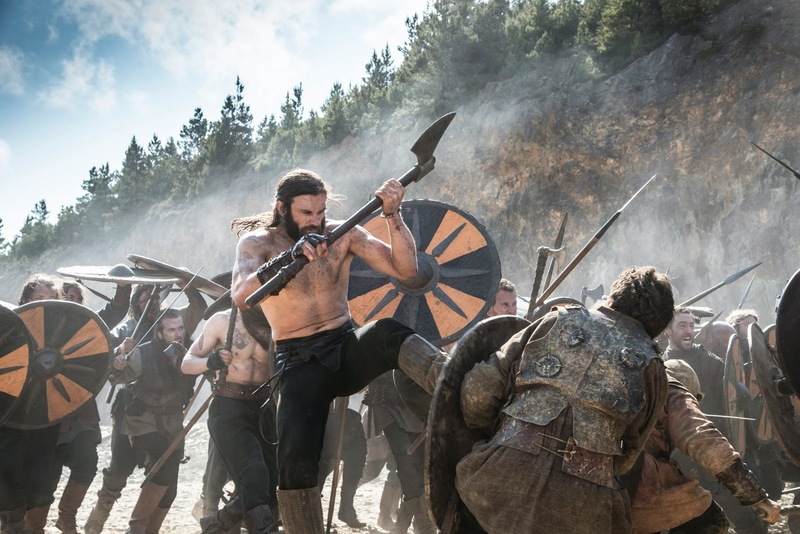 On a more positive note, the battle at the end of the first episode showed shieldwall combat as two forces pushing and jabbing at each other. Whereas the History Channel's Vikings, a good show with great characters, shows shieldwall combat as two armies forming into walls, and then running like crazy at each other. 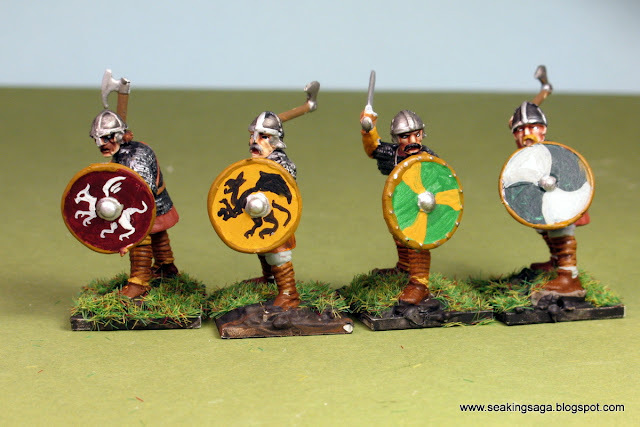 Here are some remaining Gripping Beast plastic Saxons I painted this week with the Last Kingdom as inspiration. 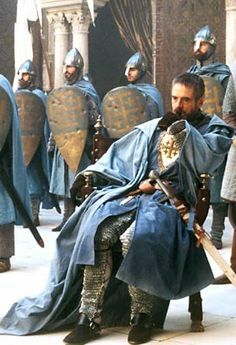 My color choices are a bit brighter than the series - thank you Peter Jackson for turning all medieval themed costuming into blacks, browns and greys. 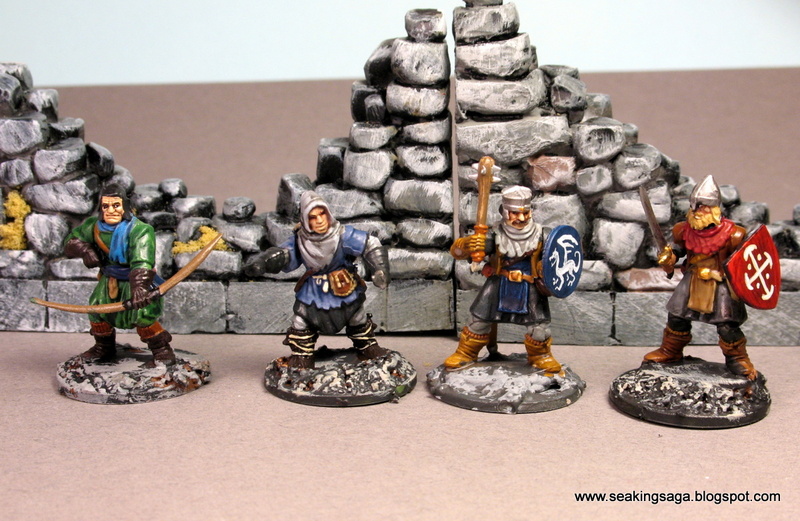 These are one of the oldest plastic Dark Ages sets available, and I think it shows. 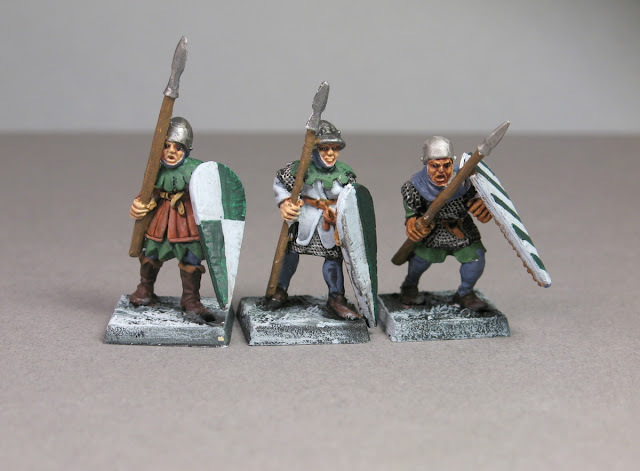 While better than the Wargames Factory line, the posing and options are limited, and the definition on the chain mail is muddy, especially on the sides. 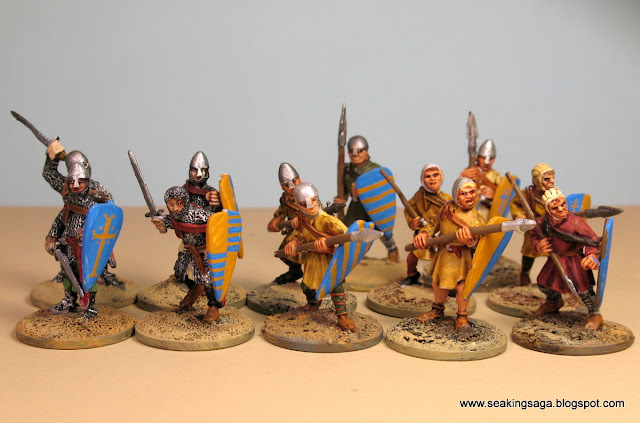 Nonetheless, they are great for building up an army in a Hail Caesar type game, but for your elite troops in a skirmish game, one might want something with a little more distinctiveness. 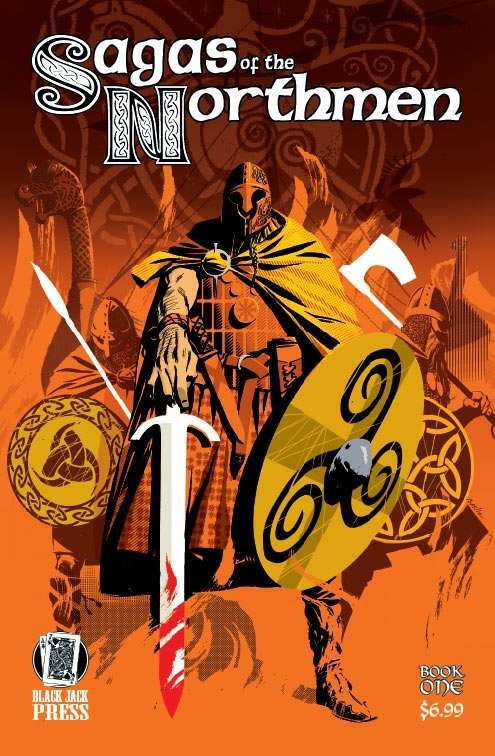 If you are looking for some more Viking themed media, I highly reccomend a new graphic novel I received recently through a Kickstarter I backed. It is a $6.99 digital download currently, with a print edition promised later. After almost a year of owning the expansion, I finally got around to playing a game using a new army from Crescent and Cross this past Saturday. 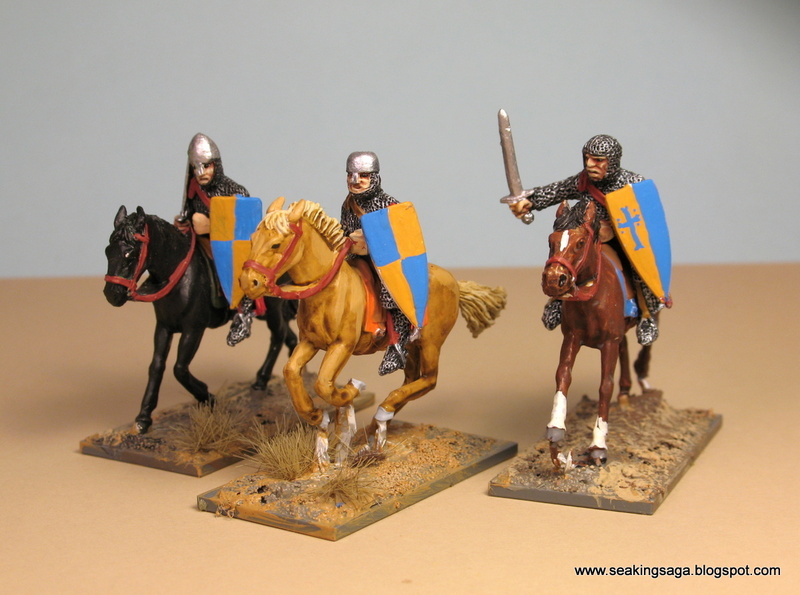 The Byzantines have three warrior units, one armed with bows along with a unit of mounted hearthguard and steppe nomad mercenaries. 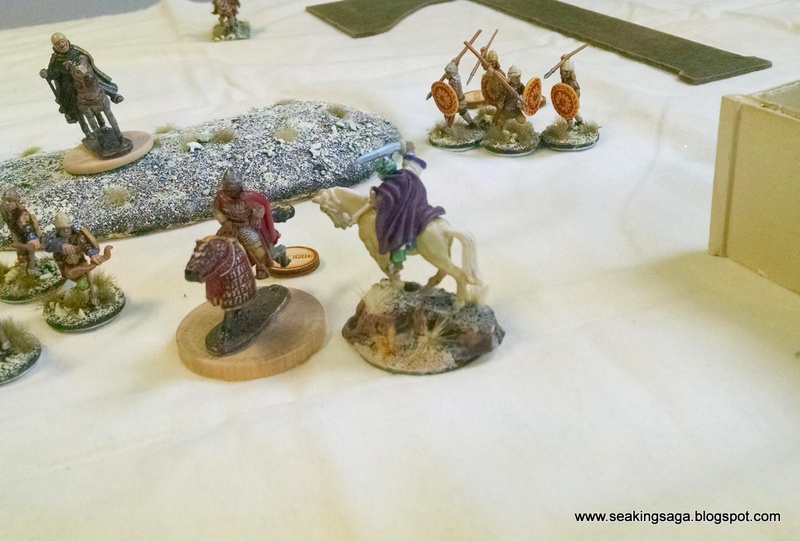 The warlord is accompanied by a priest. Below, setup at the start of the game. 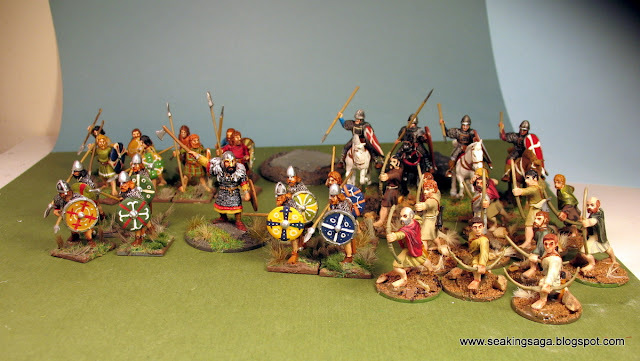 The Moors are on the left, the Byzantines on the right. 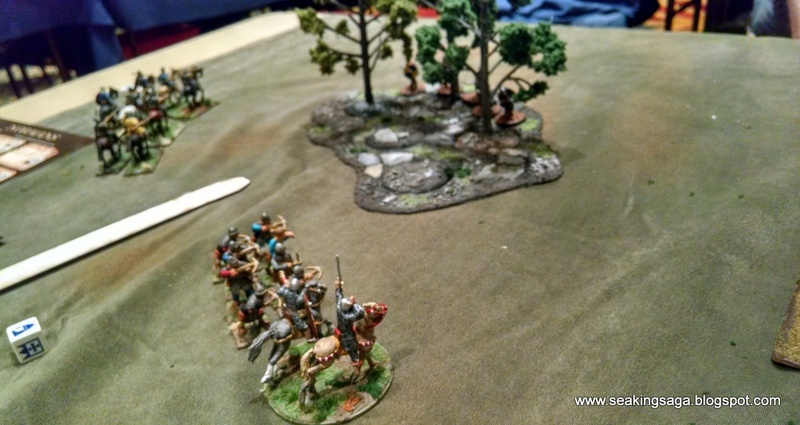 I spread out, and my opponent tightly groups his units. I should have saw that as an indicator of what was to come. Another view, with the Byzantines behind the small hill. 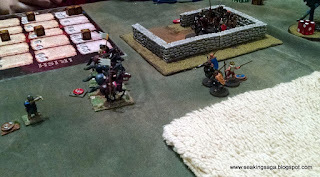 On my turn, I advance my mounted hearthguard, possibly to use the building as a screen. As his steppe mercenaries advance from around the oasis, one my hearthguards wheels toward them. 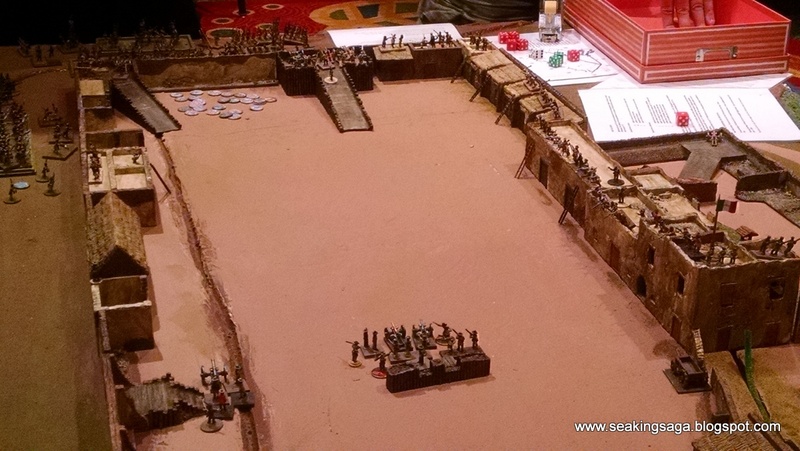 Hopefully they could throw javelin, engage the nomads and allow the Blackguard and supporting warriors to close in. Of course, they are halfway across the board before that can happen, but not before we take two from each unit. Bad news when that's half your unit. More bad news for the Moors. I tried to bribe the steppe nomads away from the Byzantines for a turn ("Corruption"). Unfortunately, my opponent took the three fatigue on the Warlord option. Weighing the possibilities, My warlord and hearthguard was within striking distance of his warlord in a couple of moves. Hit 'em while he was down, I thought. 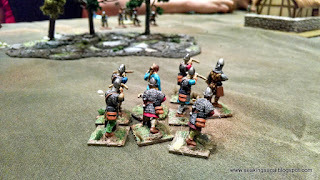 These warriors intercepted me - but maybe hearthguard against warrior? 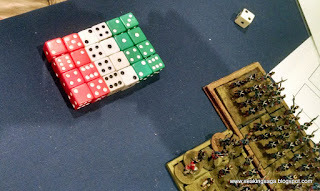 Not too risky...However, since his formations were so tight, he drew half the attack dice from a nearby unit (Strategikon). 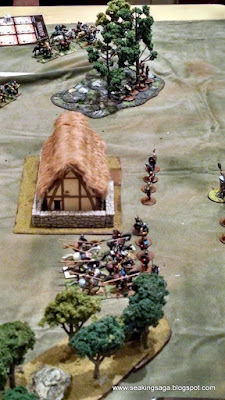 A good roll and four Moors down, taking only two spearmen with them. Know your opponent's battleboard, folks. The Moors fortunes improve. The blackguard hit the steppe mercenaries, taking out all but one with no cost to themselves. 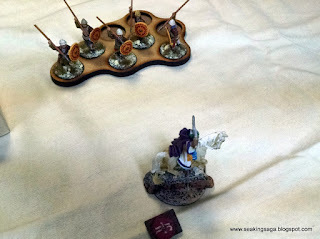 Some great melee abilities are on the Moorish battleboard. 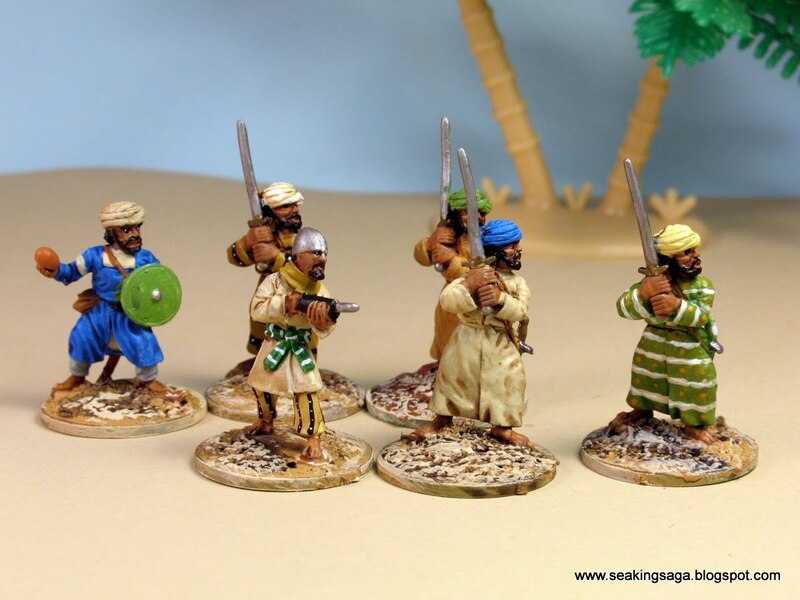 A unit of Moorish spearmen do about as well against some Byzantine infantry. only received one hit (ignored) and I put four on the Greek. He saved on three (or was it four?) and took no damage. 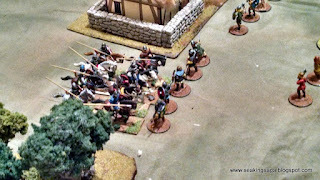 As the attacker, I was pushed back, and he followed up with a side by side attack with spearmen. I think I took something like six or seven hits and only saved three. 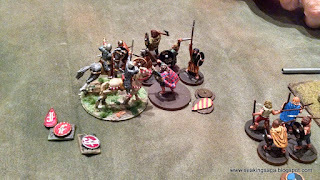 The nearby unit of levies couldn't take any of the hits ending the game. For my first run through on the Moors, I am overall pleased. 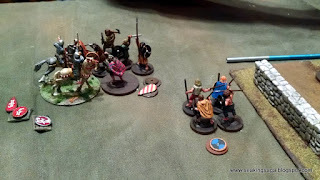 I like the faction and will play them again. 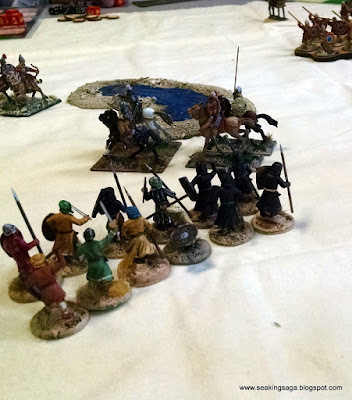 Most of my problems were in my unit composition and not paying attention to the Byzantine abilities. The Moorish hearthguard have javelins, and the lower armor penalty that comes with it. I don't like shooting hearthguard, especially if it is with javelins, a rather poor trade-off in my opinion. In light of bow armed cavalry, the javelins are a weaker weapon with the same disadvantage. Next time, I will go with a full eight Blackguard; they did the job when required. 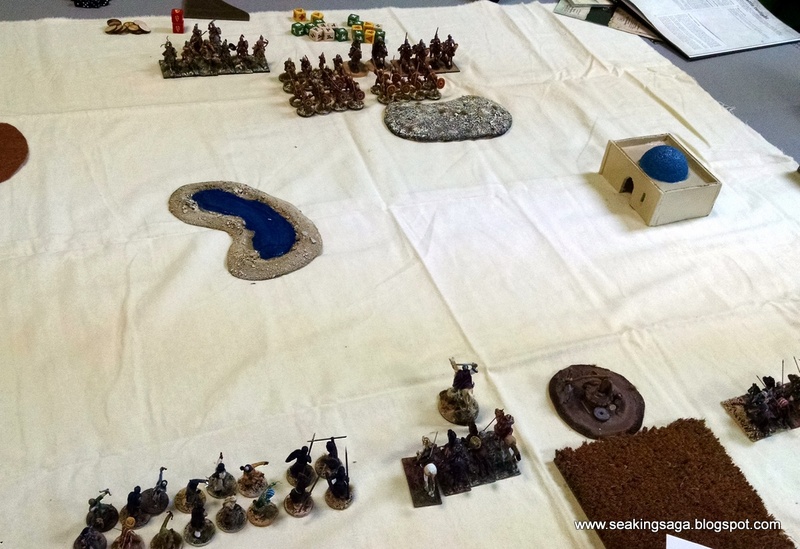 All in all a fun game, and a great start to Crescent and Cross. MacBeth has been hovering at the edge of my awareness lately for several reasons. Perhaps it is the upcoming movie with Fassbender, which seems to be as much influenced by Game of Thrones and TV's Vikings as by William Shakespeare. MacBeth as history has taught us, was a Scottish lord, who received a prophecy from three witches that he would one day be King of Scotland. Slowly descending into madness, he murdered his king, and many others, friend and foe alike, at the urging of his power hungry wife. 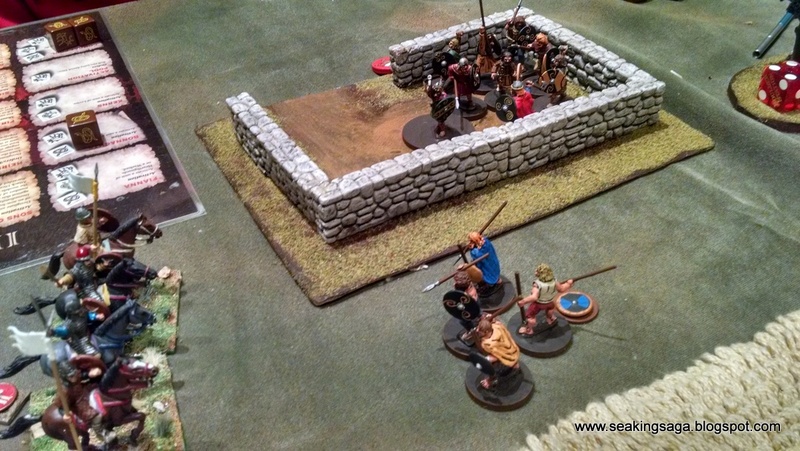 Shortly thereafter, he was killed by the rightful heir and an army of men wearing Dark Age ghillie suits. Right?...Not exactly, but it does speak to the power of Shakespeare in particular and literature in general to alter our perceptions of history. In discussions I have had with Lit teachers, it is fair to say that a number of them take Shakespeare's plays for more or less accurate representations of events. Sure, Julius Caesar was really killed in a theater and not in the Senate, but the deed and perpetrators played out on stage as it did in reality. Similar discrepancies from history can be found in Antony and Cleopatra, the Henry cycle, but to suggest that MacBeth was a good king and hardly the murderous madman the Bard depicts goes against even their broadest interpretation of artistic license. MacBeth or Mac Bethad mac Findláich, was born in the early eleventh century. The monarch of Scotland through much of the period was Malcolm II, whose long reign was made possible by the strategic marriages of his several daughters to powerful families in Scotland and the Orkneys. Some sources place Macbeth as being born from one of these marriages eventually elevating himself to be the lord of Moray. Thus, after Malcolm's death and the succession of his grandson Duncan to the throne, Macbeth found himself as a vassal to his cousin. 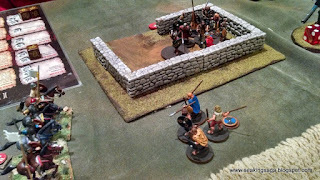 For reasons not quite clear, Duncan invades Moray and was killed. Either because of his victory or his blood descent from Malcolm, MacBeth was elected High King in 1040. His reign was long and stable, enough that he was able to go on a pilgrimage to Rome in 1050. A few years late he was challenged by Duncan's son Malcolm, and the king met his death in battle in 1054. Malcolm did not become king immediately, for he had to kill MacBeth's stepson Lulach. After accomplishing this task, Malcolm was installed as King Malcolm III. Shakespeare's play The Tragedy of Macbeth premiered around 1606, a few years after the coronation of the Scottish King James. Not coincidentally, England's new monarch affected Shakespeare's writing in some very specific ways. Obviously, the Scottish setting was the most important, so much so that superstitious actors sometimes refer to MacBeth as "The Scottish Play." Furthermore, one of James' ancestors and MacBeth's victims is flatteringly depicted. The Witches of MacBeth by RAFM. 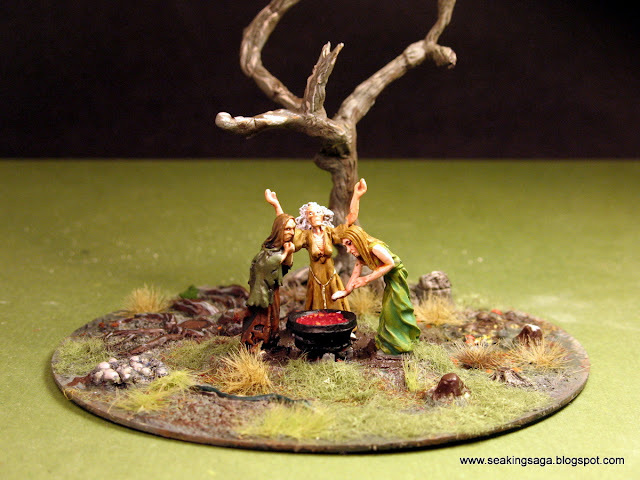 The CD-base diorama was mostly sculpted from Miliput and flocked. The most intriguing influence by King James on Shakespeare's MacBeth is inclusion of the three witches in the first scene. King James was fascinated by the study of witchcraft and he even wrote a text on identifying witches called Daemonologie. Shakespeare was certainly playing to the contemporary interest in witches when he made them a major part of his story. 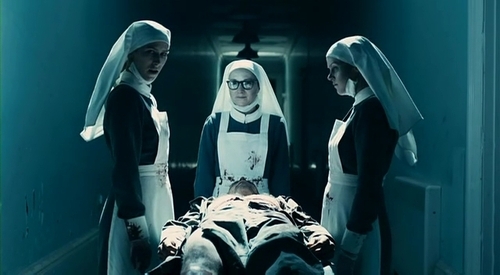 Highly recommended is the 2010 Patrick Stewart adaption of the play which modernizes the setting and show the three witches as hospital nurses. King Hereafter by Dorothy Dunnett - a book I try to re-read every couple of years. It's massive in scope, and ambitiously proposes that MacBeth and Thorfinn of Orkney were not cousins, nor half-brothers, but the same person. It is not a literary gimmick, and the author genuinely believed it to be true based upon her interpretation of the various sources in her research. Thematically, the novel covers the end of the Viking Age, the decline of paganism and the incorporation of the northern European hinterlands into the realm of Christendom. Macbeth the King, by Nigel Tranter - A straightforward historical account of Macbeth's rise and fall. Tranter is no great stylist or revisionist, but there is an efficiency in his prose and his prolific output is nothing to sneer at. The official mini for MacBeth is huge (over 32mm), as are most of the SAGA line's hero character. 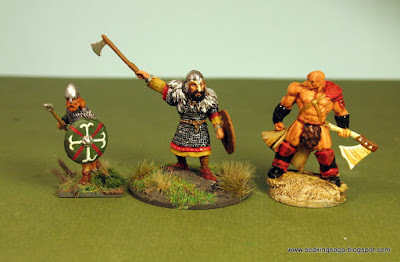 Below, a comparison shot with a Crusader mini (left) and a Reaper Barbarian. 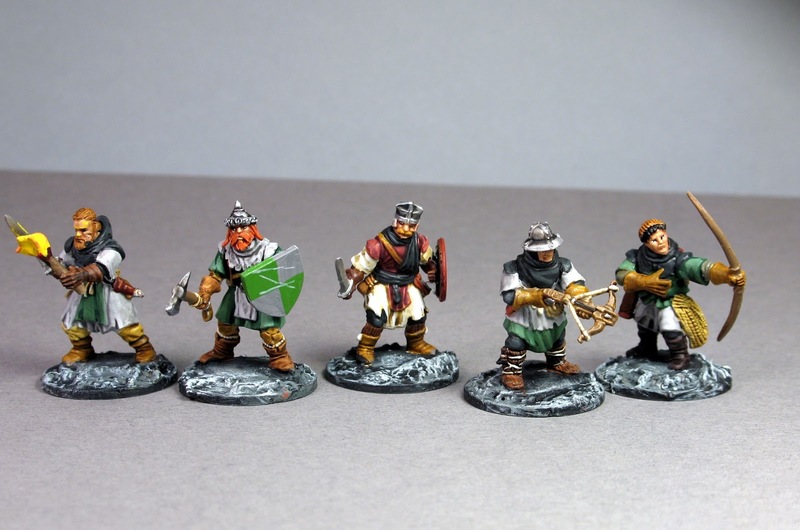 The scale of most of Gripping Beast's Hero characters are more in line with current fantasy ranges. As a named hero, MacBeth is fairly typical in abilities, with little chance of game-breaking especially if paired off against another hero. 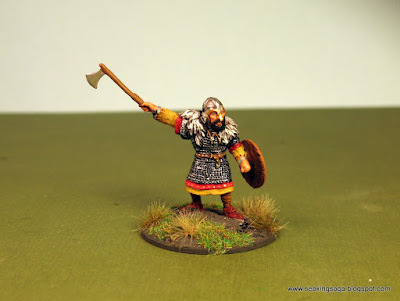 Hero of the Viking Age. MacBeth generates three SAGA dice. This is mandatory if I play a hero character. If I spend a point on a hero, I need the extra dice. I admit that I am not a skilled enough player to make use of special heroes who generate less dice, but have other abilities to compensate. Norman Exiles. One unit of eight hearthguard can be mounted Norman knights. A number of these served in MacBeth when the Godwin's began to exert more control over the Norman favoring English king Edward. This is perhaps the earliest example of the Scottish-French alliance against their English rivals. Great Ruler. 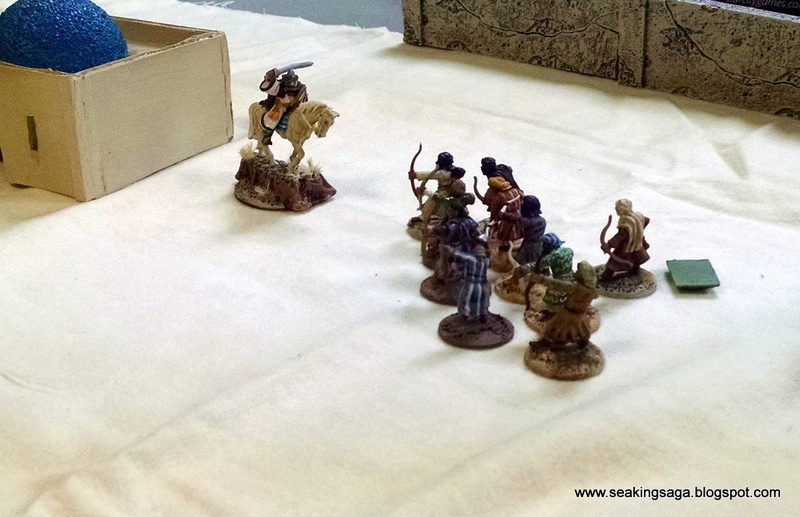 As long as MacBeth is on the table, you always roll six SAGA dice. A great power, but doesn't it make his three SAGA dice ability irrelevant? Another minor ability in place of Hero would be better. I am a little late getting my pictures up from Nashcon on May 22nd. I drove up early Saturday morning - it was only about a 2 1/2 hour drive. The SAGA tournament was fun, but a little sparse in turnout. 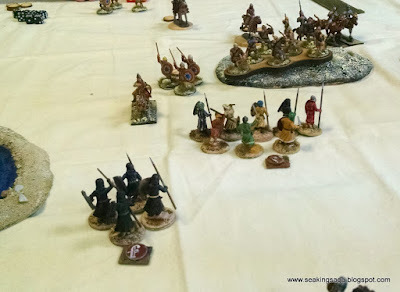 My first match was Normans against Vikings. 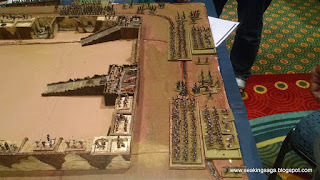 It was a real education in how to use a battleboard. MY opponent concentrated on making a single attack and stacking every possible effect into that attack. 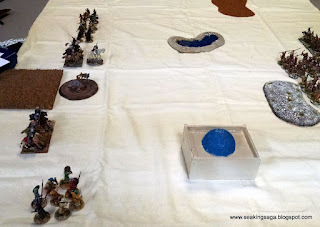 A single move wiped out entire units. 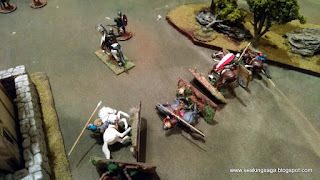 These last few shots are of my warlord and his four remaining sergeants on a glory bound suicide attack. The game had went on too long, with a battle of attrition going against me. Time to go out bold, I thought. The real highlight of the day was an afternoon match in Alamo game run by Doc McBride of Splintered Light miniatures from his own rule set, Bloody Dawn. The rule set was I played the Texans with two partners (pardners?). It was funny being told before we began that we would lose and be killed to a man. However, if we could take 600 Mexicans with us, that would satisfy the win conditions. After a short learning session, we took assigned roles. I commanded the units at the main gate. 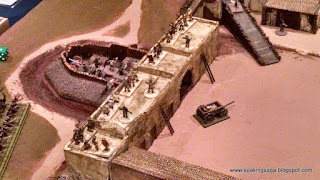 Though in our game, most of the action took place at the North Wall. The Mexican team thinks arranging the dice pool into a flag will help their luck. Mexican forces take the wall, but are quickly routed with some timely hits on "6" and the special damages that occur. 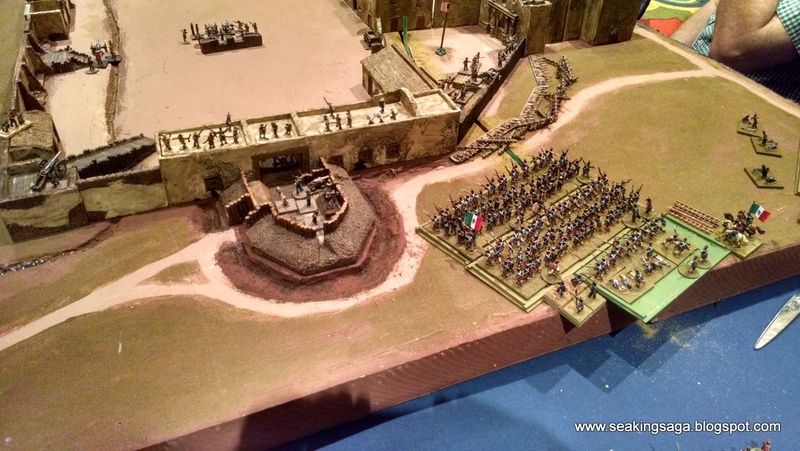 In the end, our Texans killed well over 600 before the enemy occupied the main plaza. 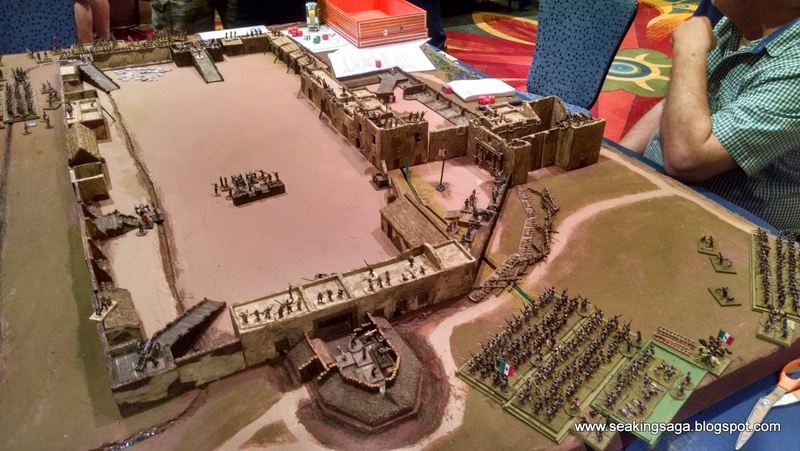 "Remember the Alamo!" This game was a first for me. 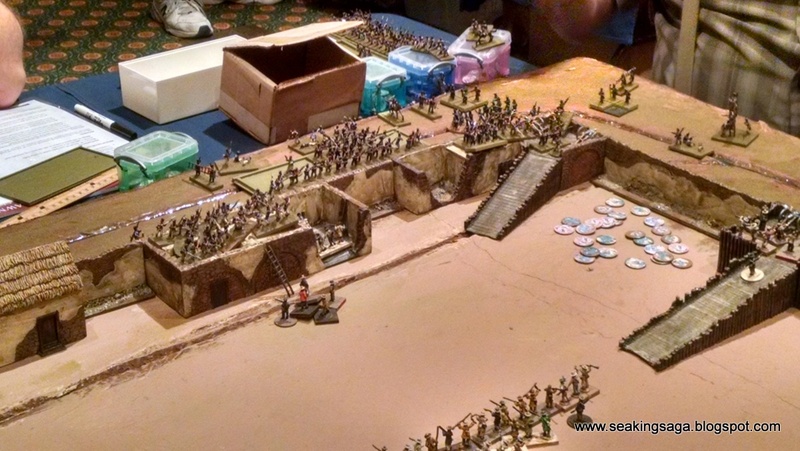 Until now, I have never gamed anything in the 19th century, nor have I ever used 15mm. It is definitely something I might be more interested in doing - however the experience of playing with the rules author on a massive custom table would be hard to match on my own. Maybe that's what cons are for. Bloody Dawn rules at Wargames Vault.